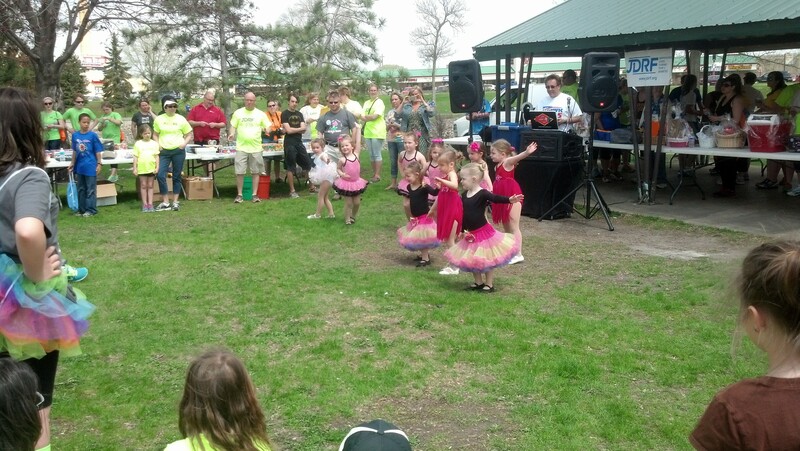 Watching these little ones perform at the end of the JDRF walk today was priceless. They made the crowd smile. As you can tell, a lot of music seems to pop into my head, a lot! Diabetes isn’t the worst thing that could ever happen, but it’s far from my favorite. This topic is supposed to be about looking back at the week of blogging, and what the favorite part of the week was. One of my favorite memories of this past week is that I actually completed the full week of blogging! I tried for the first time last year, and I failed at doing it every day. It takes a lot of commitment to blog everyday about a predetermined topic. I am proud of myself for doing it this year! And I look forward to next year. Another of my favorite things about this past week is having a new person comment not once but twice on a blog. My favorite being the comment on Day 4. I never really expected people other than family and friends to actually read the blog. So it is really cool that someone new has decided to read and comment. Thank you Kelley for stopping by and showing some love to a new blogger. You made me smile and you made my week! This entry was posted in Uncategorized and tagged blogging, commitment, dblogweek 2014, favorite things, JDRF, julie andrews, Type 1 Diabetes, walk to cure on May 18, 2014 by Charity. 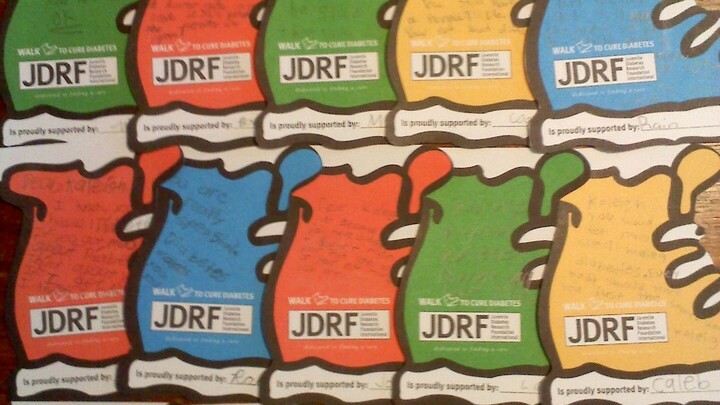 It’s hard to believe that February 22, 2014 will be our 6th year walking at the JDRF Walk to Cure Diabetes. It will be our 5th year of having our own family team. On November 23rd, we celebrated my 5th year of living with Type 1 Diabetes. Last year, at the walk, I was one of the “Thank You” Kids. I went up on the stage in front of thousands of people to help hold up letters that spell out THANK YOU when the total amount raised for the walk was announced. I was scared and excited to have the honor to participate. Over the past year, I participated in many activities. I am a member of the 4H program in my county. For the past 3 county fairs I have done a project on Type 1 Diabetes. I hope that my projects will help educate others about this autoimmune disease that affects millions of people. I wear an insulin pump and a continuous glucose monitoring(CGM) system. Sometimes I feel like a robot or cyborg, with everything that is attached to my body. I poke my fingers to check my blood sugar approximately 10 times a day. My insulin pump site is changed every 2-3 days, and my CGM site is changed once a week. When I sleep my mom makes sure that I stay safe. She checks my blood sugar and gives me sugar when my blood sugar is too low, and gives me insulin if my blood sugar is too high. 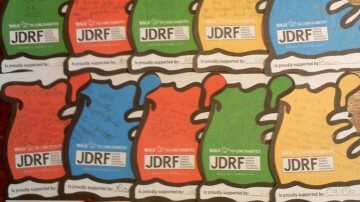 I enjoy raising money for JDRF, to help find a cure for diabetes. JDRF is the largest charitable supporter of T1D research; JDRF is currently sponsoring $530 million in scientific research in 17 countries. 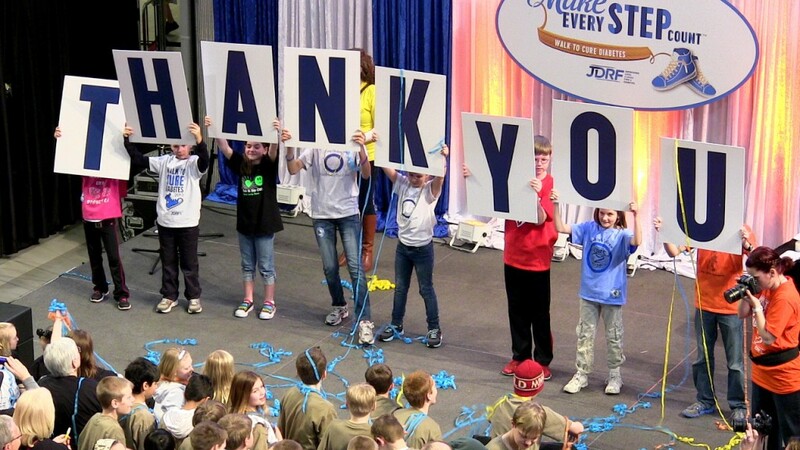 In 2012, JDRF provided more than $110 million to T1D research. In 2012, Forbes magazine named JDRF one of its five All-Star charities, citing the organization’s efficiency and effectiveness. 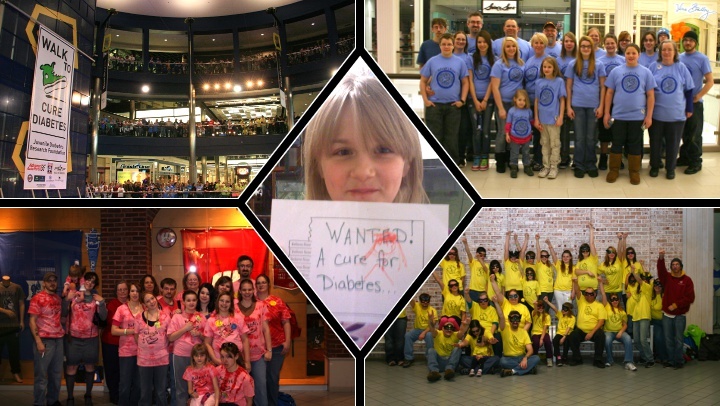 JDRF was created, and is still led by people with a personal connection to T1D. Whether it’s providing funding for a late-stage clinical trial, advocating faster regulatory approval of new devices, or partnering with a company on research that might not otherwise receive funding, every decision JDRF makes is driven by their commitment to achieving a world without T1D. We are proud to be part of the JDRF team, where we are working with them to turn Type One into Type NONE! I am also doing what I can to help find a cure, by participating in different research trials with T1D Exchange. I dream of saying, “I once had Type 1 Diabetes” and being able to say thanks to all the amazing people, like YOU, who helped in finding a cure! We have started our fundraising campaign for 2014, with a goal of raising $3000 as a family, and $6000 as a family team this year. If you would like to join my team, please go here to register as a member of my team. If you can’t be with me on walk day, you can register to be a virtual walker and walk where you live. I hope you will join my team and help me meet my fundraising goal this year. Please help us reach our goal and help find a cure for Type 1 Diabetes. Your donation is tax-deductible. You can support us online here or you can make a donation in person or by mail. We look forward to seeing your name on our list of friends helping to find a cure! Help make Type One into Type NONE! We can’t do it without YOU! This entry was posted in Uncategorized and tagged family, insulin pump, JDRF, sports, support, T1D, team, thank you, Type 1 Diabetes, walk, Walk to Cure Diabetes on January 11, 2014 by Charity. 82 days until our JDRF Walk to Cure Diabetes 2014! Sneakers with messages of support from classmates. We will be selling scarves, boas, jewelry. We will be putting out change buckets again. We will be putting out JDRF sneakers again. We are hoping that the school will allow us to do a fundraiser of sneakers through the whole school. As well as my daughter wants to do a change challenge like she did last year between her pod of classrooms. We will be mailing out our family walk letter and asking our family and friends to help us in raising money to help in finding a cure. We need to recruit more people to register for our walk team, the more people we have helping raise money means that each person has less to raise to meet the team goal that has been set. We will be blogging about our countdown to the walk, and what we are doing. We will also be blogging about what the walk means to each of us. We hope to get a few guest bloggers as well. So if you are a family member or friend who has been with us for these walks, we might ask for you to write something up for us to post on here. This entry was posted in Uncategorized and tagged countdown, Diabetes, JDRF, T1D, Type 1 Diabetes, walk on December 2, 2013 by Charity. There is currently no cure for Type 1 Diabetes. Although there are a LOT of ‘miracle (READ this as WACKY) cures’ out there, none of them will cure Type 1 Diabetes. Until there is a cure, we will walk and make every step count! Some believe insulin is a cure, it’s not but it does keep my daughter and many others alive. Each year we walk at the JDRF Walk to Cure Diabetes. This will be our 6th year walking, but our 5th year having a family team. We love the walk. It’s a great gathering of our family and friends. For my daughter it’s about being among others who know what it’s like, a feeling of belonging. It’s a huge celebration and one day we hope that we will still meet and celebrate having a cure! Until there is a cure we will raise money, walk, and educate others. We will make every step count! This entry was posted in Uncategorized and tagged cure, Diabetes, dmpad, JDRF, miracle cures, T1D, Walk to Cure Diabetes on November 24, 2013 by Charity. 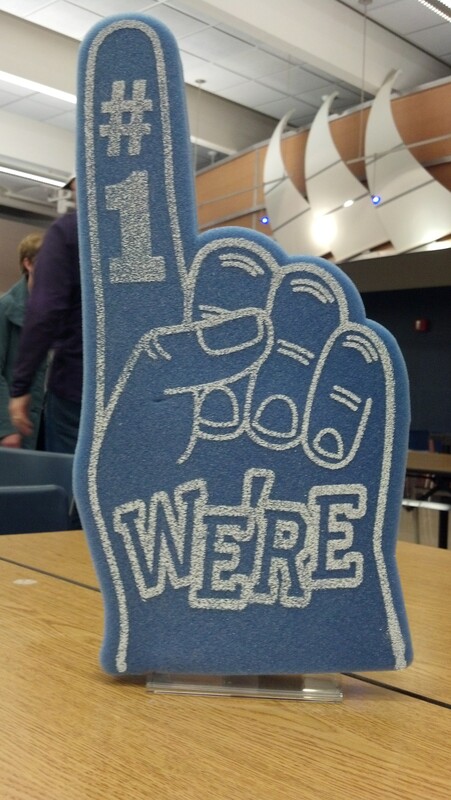 On November 16, we had the pleasure to attend the 5th annual Reach & Teach U. These events are always so great. We learn more about what is happening in research, listen to multiple guest speakers, meet more people that are on this journey with us and kick off the Walk to Cure Diabetes! This year the keynote speaker was Kerri Sparling writer of Six Until Me. She is an amazing speaker, just as she is a blogger. She is so full of life and speaks with such candor. I was expecting humor, and it was delivered. She makes the daily trials that we all go through so humorous. We then heard about the research that is going on right now. Next up, diabetes burnout and a child’s role in diabetes management. Moira McCarthy Stanford’s book “Raising Teens With Diabetes: A Parent Survival Guide” from the blog Despite Diabetes was a suggested book. I’m in the process of reading this book right now. Biggest thing we took from this session was don’t give your child too much responsibility too early, it will only cause them to have a burnout. There is a difference between knowing how to do things (checking blood sugar, giving insulin) and remembering to do them. Remember everyone forgets at some point, don’t go ballistic on your child for forgetting. not enabling, but instead EMPOWERING one another. Burnout is normal, so don’t beat yourself up. We need to expect the best while planning for the worst. When we feel we have failed as a parent of a child with diabetes or as a person with diabetes, we need to remember that we didn’t fail, the beta cells of the pancreas are the failure. Our last session before lunch was on the use of media for diabetes education and care. They discussed navigating the web and getting relevant and correct information. Trusted sources of information include JDRF, ADA, PES (pediatric endocrine society), children with diabetes, and medical institutions. blogs are anecdotal but they are great resources for information and in finding someone who’s been where you are now. Be wary of “Miracle Cures”, we’ve all seen them out there. But be cautious. Cinnamon, wishing on falling stars, or imagining that you no longer having diabetes won’t cure you of diabetes. Then it’s our favorite part of the day, no not the lunch portion but that’s always really good as well! It’s the kick off for the upcoming walk! During this kickoff portion of the day we hear from the upcoming walk’s family ambassadors and what the walk means to them. We love participating in the JDRF Walk to Cure Diabetes! This will be our 5th year walking. The walk is 13 weeks away. It’s coming up fast and this means we need to kick our fundraising into high gear! The goal for JDRF this year is $1,750,000. Our family teams goal is $6,000. We hope we can raise this much money for the 2014 Walk to Cure Diabetes! We look forward to the walk and next years Reach & Teach Session! This entry was posted in Uncategorized and tagged artificial pancreas, burnout, Diabetes, empower, encapsulation, JDRF, prevention, reach & teach, research, restoration, smart insulin on November 23, 2013 by Charity.